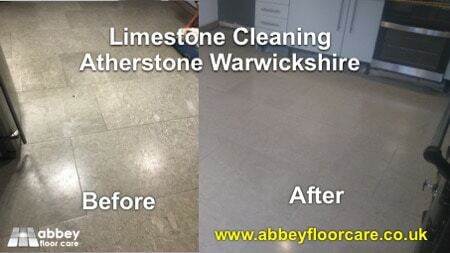 This Limestone Cleaning Atherstone project arose after our client moved to a home with a 20-year-old Limestone floor. The old sealer had a lot of ingrained soil. In some areas, it was very discoloured. 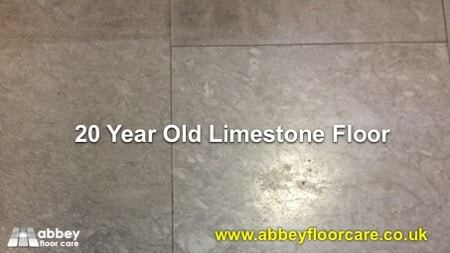 So they called on our Limestone Cleaning services to strip off the old sealer and re-seal their Limestone floor. We estimated that stripping and resealing the limestone tiles work would take two days. However, it turned into a job that took three days after the stripping and resealing turned into grinding, honing and sealing. The photo below shows that the floor was very soiled, with quite a lot of abrasion in the form of scratches and surface pits, on the surface of the limestone. We tested the sealer to find that it was probably a urethane based sealer rather than a standard water based acrylic sealer. We started by applying a specific gel-based stripper to soften the Urethane sealer ready for removal. The stripper was left for an hour to do its work. We used a combination of rotary brush scrubbing and pad scrubbing to break the old sealer away from the surface of the stone. Then we vacuumed away the slurry containing the sealer residues. The edges of the floor were very soiled and had a thick build-up of old sealer, so we had to remove the sealer by hand with abrasive pads. Limestone is a very porous stone, so we had to wait until the floor started to dry out before we could assess the effectiveness of the stripping. Once the floor started to dry, we could see that the underlying stone surface was very rough, like sandpaper, still with ingrained soil, and marks. The ingrained soil indicated that either the floor had not been sealed when installed or it was not sufficiently sealed. Dirt and stains had soaked into the surface of the stone. Then the old Sealer had been applied over the dirty, stained surface. We explained the situation to our client and recommended that the rough, stained surface needed to be ground away, to create a new clean surface. The floor was reasonably smooth, with little lippage, so we did not need to use metal diamonds to remove the lippage. We started by grinding the tiles with 50 grit diamonds. The 50 grit diamonds removed the surface of the tiles, leaving a new clean finish. Then we honed the floor to a smooth 200 grit finish, matching the finish on other parts of the floor, which did not need restoring. 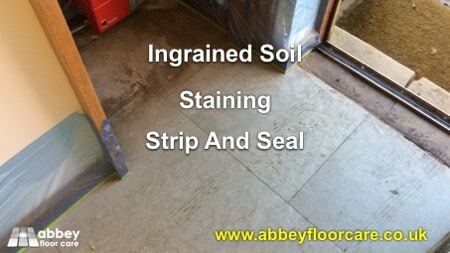 As the limestone is porous, we applied a layer of impregnating sealer to prime the floor ready for finish sealing. Finally, we applied six thin coats of acrylic water-based mid-sheen surface sealer. 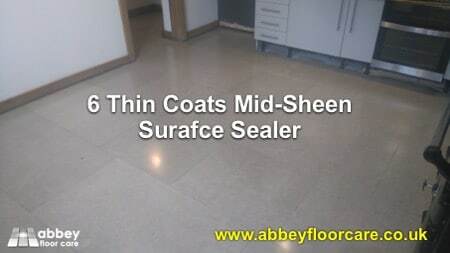 We recommended the surface sealer as the floor is a high traffic area, which will suffer from a lot of tracked-in soil from both the homeowner’s family and their numerous pets. So the surface sealer will act as the wear layer and helps protect the Limestone. As you can see, the result is a beautiful, easy to clean floor, with a finish that, with the correct cleaning, will last for years to come. 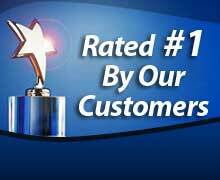 Our client was absolutely delighted with the results. 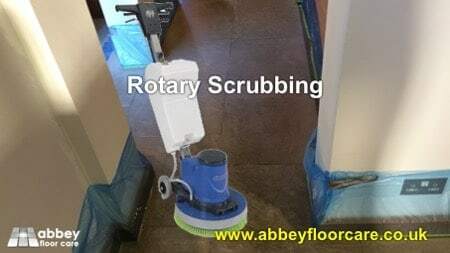 The floors suffer from a lot of tracked-in soil, so we recommended that the rooms are dry swept at least once a day, and damp mopped daily with the recommended cleaner. 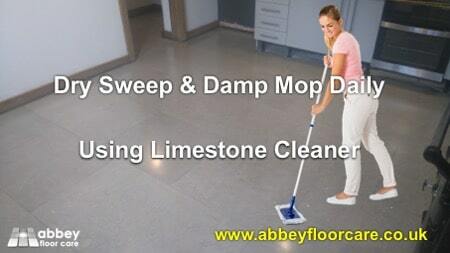 The Limestone cleaner we recommended will help maintain the surface finish. 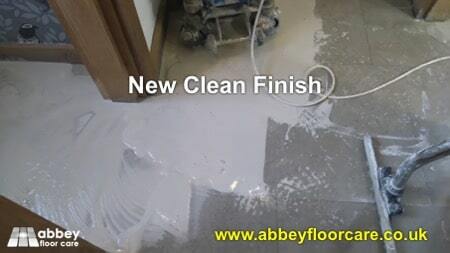 Any areas showing wear can be topped up with new sealer, helping extend the life of the finish. 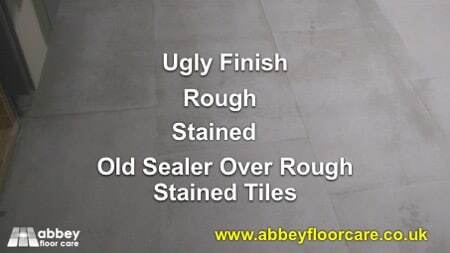 If you have a limestone floor, or any other stone floor in need of cleaning or restoration, please contact Abbey Floor Care for a free, no-obligation quotation, we will be happy to help.